Community Outreach Partnership Centers (COPC) sponsored by the United States Department of Housing and Urban Development (HUD) have identified civic engagement and community partnership as critical themes for higher education. 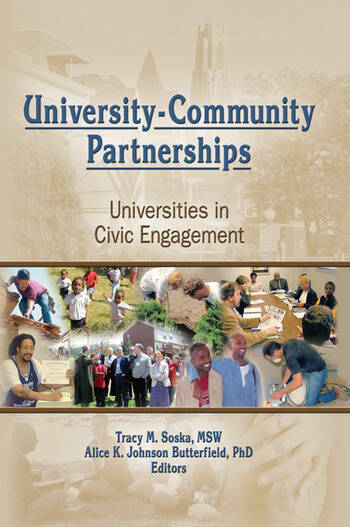 This unique book addresses past, present, and future models of university-community partnerships, COPC programs, wide-ranging social work partnerships that involve teaching, research, and social change, and innovative methods in the processes of civic engagement. The text recognizes the many professions, schools, and higher education institutions that contribute to advancing civic engagement through university-community partnerships. One important contribution this book makes to the literature of civic engagement is that it is the first publication that significantly highlights partnership contributions from schools of social work, which are rediscovering their community roots through these initiatives. University-Community Partnerships: Universities in Civic Engagement documents how universities are involved in creative individual, faculty, and program partnerships that help link campus and community-partnerships that are vital for teaching, research, and practice. Academics and practitioners discuss outreach initiatives, methods of engagement (with an emphasis on community organization), service learning and other teaching/learning methods, research models, participatory research, and high-engagement techniques used in university-community partnerships. The book includes case studies, historical studies, policy analysis, program evaluation, and curriculum development. University-Community Partnerships: Universities in Civic Engagement is one of the few available academic resources to address the importance of social work involvement in COPC programs. Social work educators, students, and practitioners, community organizers, urban planners, and anyone working in community development will find it invaluable in proving guidance for community problem solving, and creating opportunities for faculty, students, and community residents to learn from one another.